I am so jazzed. I have a whole new section to introduce to you today! I’m calling it The Filing Cabinet, because that’s where I’ll be filing away all kinds of extra goodies for you. 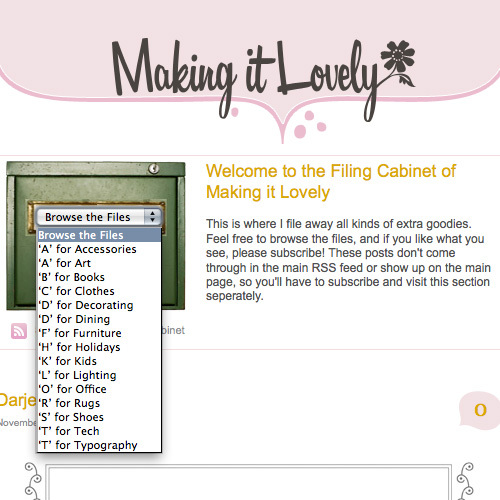 And when you’re actually in The Filing Cabinet the sidebar will show you images from the latest three posts on the main section of Making it Lovely. It’s all very fancy. So what can you expect to find amongst the files? A little bit of everything and anything that catches my fancy. Furniture. Lighting. Fonts that set my hear aflutter. And you can quickly see what’s in each file at a glance. Here’s a peek at the ‘S’ for Shoes file. Head on over and check it out. There are already about ten pages of goodies to look through, and I’ll be adding more all the time. The new posts can only be seen in The Filing Cabinet, and you can subscribe separately to that feed to have new entries delivered right to your feed reader or inbox. Yay! Congratulations on your new section! I had a feeling IE might give me problems. I’ll have to look into it. Fun!! 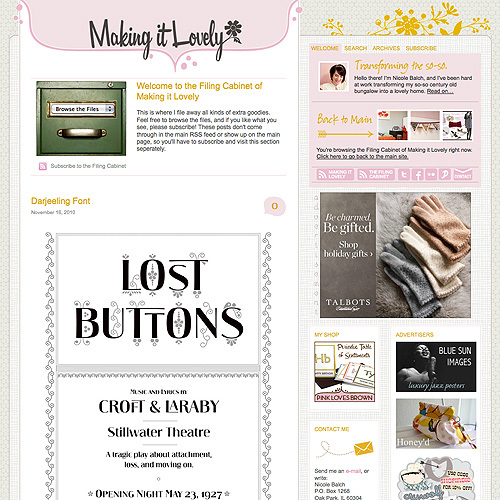 I always love checking out your ‘wists’ and this is so much prettier!! I love that the drop down menu fits perfectly in the cabinet, I have a basic programming knowledge and can only imagine the work that took. bravo! Looking forward to some pretty goodies!! sooo cool! 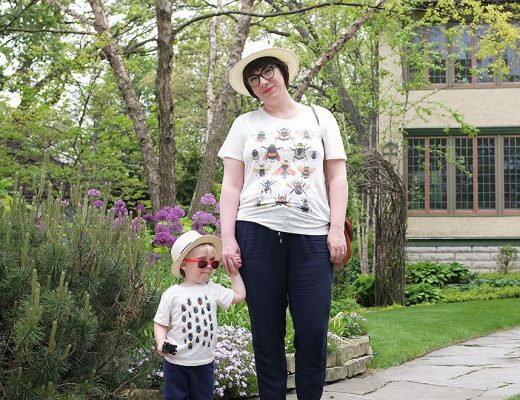 as always, thanks for sharing – you always have such fun and beautiful style! And isn’t WordPress, like, the BEST!?!?! You are totally awesome, any chance you are going to opne up Smart & Lovely soon?? Well, I was going to, but now I’m not sure. 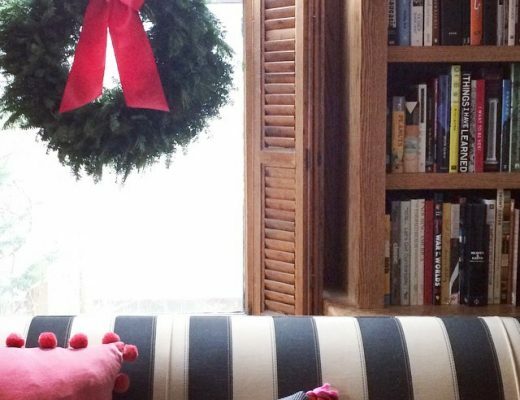 The holiday season is a busy time for me with my shop, and life is sure to be a bit hectic when the baby arrives. What a good idea. I will be peeking into your files for sure. How cute! What a great idea! 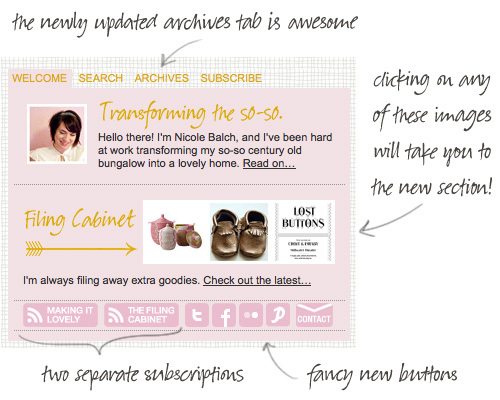 Holy amazeballs that filing cabinet graphic with the drop down is fantastic Nicole! Kinda sorta obsessed with how charming the whole filing cabinet idea is. Love it! I love this feature and I love you new picture!!! Oh, yes! I had been trying to fix that but ran into problems. I meant to come back to it, but I had forgotten. Thanks. Congrats on all the updates! Thank you for making sure a must read website you deserve all the accolades and sponserships you can get, because you work sooooo hard and you make a quality product. The filing cabinet isn’t displaying for me properly either… (also using IE). There is a big blank part at the beginning with some text cut off to the far right. And it says “error on page”. But from what I do see, it looks great! WOW! this is amazing! The filing cabinet drop down thingy is so cool. i bow down to your amazing coding skills! This. Is. Awesome. I can’t imagine how much time it took you to do this, but what a great feature. And the individual subscriptions? Genius. You really thought about your readers and what we would want – even what we didn’t know we wanted! Job well done. Super fun to browse your filing cabinet. I feel like I’m sitting cross-legged on the floor, going through your idea folder! Love it. Well done! I love it. I also love visiting you through your site to check out all the great things you do and make available for us all. Funny I accidentally clicked on it yesterday and went, oo lookie here, what’s this? I will definitely be checking it out when I finally get some new lighting or anything. How awesome – I already added it to my reader! I’m jealous of your web writing ability. I’m completely clueless and will never be able to do anything cool to my blog! Don’t I spend enough time on your blog already?! Now I truly will accomplish nothing else in my life. Too much fun! You should seriously teach coding classes to bloggers in Chicago. Would you consider teaching workshops and such? What a great idea! This will help me spend ever-expanding numbers of hours going through all your old posts, again! I’m excited that you’re “this excited”…it makes me happy. Another job well done! I can’t wait, I love how organized you are and I am coo coo over your creativity! Hate to be uptight about spelling, but I am. The last word of the welcome paragraph is spelled wrong – it should be “separately”. Otherwise it looks great!